Regiment/Catrawd: 104th Company, Machine Gun Corps (Infantry). Service Rank and Number / Rheng gwasanaeth a rhif: Private No. 36818. Military Cemetery/Memorial / Fynwent milwrol: Caterpillar Valley Cemetery, Longueval, Somme. Ref No Grave or Memorial / Rhif cyfeirnod bedd: Plot: X111. Row: A. Grave: 1. Killed in action during the Battle of the Somme, aged 18 years. 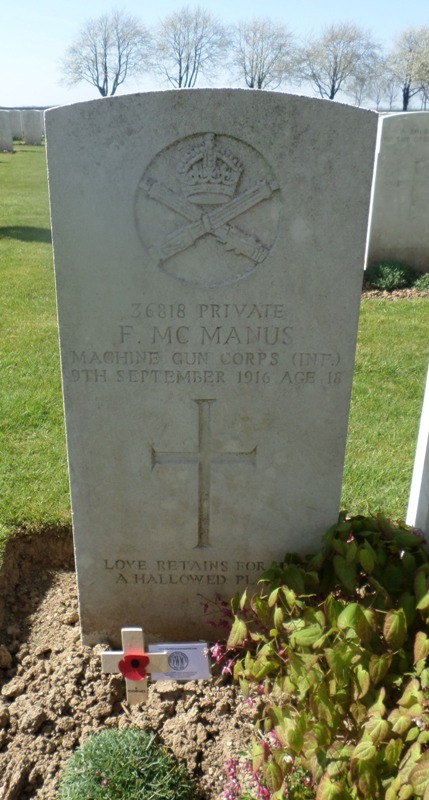 Francis McManus was born in Rhyl, Flintshire in 1898. The 1911 Census shows that the family lived at 112 Vale Road, Rhyl, Flintshire. The head of the family was Francis McManus aged 46, who was employed as a General Labourer. His wife Rebecca McManus aged 36 and their six children – Francis McManus aged 13, a Jewellers Errand Boy, Rich McManus aged 11, a Chemist’s Errand Boy, Agnes McManus aged 9, the twins – Thomasina McManus aged 3 and Simon McManus aged 3 and Rebecca Rose McManus aged 2 years. Francis enlisted at the Recruitment Centre, Rhyl, initially with the Royal Welsh Fusiliers and later transferring to the Machine Gun Corps. Dear Madam, With deepest sympathy and regret I write this letter to you on behalf of the section to which your son belonged. I am very sorry to have to inform you of the death of so respected a comrade. All we can do is to offer you our deepest sympathy in your great loss and to let you know how he died. He died doing his duty to his King and Country, as he had done so from the first time he entered the trenches with us. He surprised all of us with his coolness under fire. He was a particular chum of mine and a good one. It is a great blow to us to lose him and we quite realise what a terrible blow it must be for you. Before he entered the trenches he told us that he expected a parcel and if he was wounded or anything happened to him we were to open it and to write to you. The parcel has arrived and it is the least we can do to comply with one of his last wishes. One consolation is that he was killed instantaneously and felt no pain whatsoever. Again offering you our deepest sympathy, I remain yours respectfully, Corporal C Clark. Photograph taken on Sunday 9 April 2017 by Geoffrey Mitchell, who placed a British Legion Wooden Remembrance Cross on Frank’s grave on behalf of Flintshire War Memorials. There is a Flintshire Roll of Honour Card for Francis McManus at the County Archives Office, Hawarden, Flintshire, which was completed on 12 September 1919 and signed J Williams.